Mix resin (A) and hardening agent (B) thoroughly Mixture ratio: 1:1. Do not mix more adhesive than you can process within the pot life of 3 – 5 minutes! Bonding surfaces should be clean, dry and free of grease. For cleaning we recommend our BEST-Clean 2000. 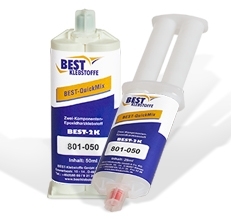 We also offer our BEST-QuickMix in 50 ml- and 200 ml-double cartridges with static mixer. When stored in unopened original container at 5°C up to 25°C shelf life is 12 months starting from delivery date.